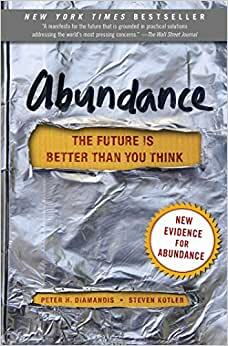 Start reading Abundance: The Future Is Better Than You Think on your Kindle in under a minute. Great for your resliance program. Would have liked to have seen a larger discussion around if human greed and self interest can be made less abundant. 4.0 out of 5 starsInformative, but written like a 300 page commercial for his products. Very informative, but tons of Mr. Diamandis' self-promotion holds it back. From the beginning, you hear about Peter's Singularity University, you learn about all of it's founders, etc. It's like, for every bit of useful information that has to do with abundance, you get the equivalent of a commercial, about how this guy keeps founding companies to teach you how to impact the world. I'm sure he's great at what he does, but being reminded over, and over, and over again about how he will teach young minds to change the world sounds to start like you're reading a pop book. This book meets the all criteria: constant endorsement, a focus on third world countries, appealing to various "technophilanthropists". You will not go thirty pages without hearing something about 1) him and his university 2) the university cofounders 3) about how his university's graduates go on to make "bold impacts" in the world (which actually only refers to Africa) and 4) his XPRIZE. The technologies mentioned in the book are amazing to learn about, but he never quite goes into enough detail for you to understand said technologies. It is a light read, definitely focused on looking pretty, scratching the surface, making sure you don't get bored. I think he wanted to sound like an educator, but ended up just sounding like a used car salesman for "sustainable enterprises" and "abundance". You hear a lot of buzzwords in this book, way more than necessary. Towards the end of the book, it gets more informative, and there are pages and pages of graphs, charts, and all that good stuff. In between, more writing, and you start to think that you got a break from being sold something. But of course, at the end of the book, you can find out where to go if you wanna be "coached" by Diamandis, or join his university, or find out about his xprize. There certainly is an "abundance" of mentions of his products and self advertisement. I found Abundance to be at times inspiring and at others frustrating. Many of the new technologies discussed in the book are impressive and could well change our world for the better. A fair bit of the author's optimism is born out with the increased prosperity developed countries have enjoyed over the last century, and improvements in computers, phones, prosthetic limbs and more has been inspirational. In this regard I found the book fascinating. But I had issues with the book I couldn't ignore, and I felt these lowered its value. One was the lengthy section at the start of the book that states negative outlooks are the result of evolution. It felt like a built in response to critics, where people who disagree with the author don't have valid reasons or concerns. Instead their opinions are the result of biology. Another big concern was how some technologies listed in the book haven't come to fruition in the years since it was printed. A good example is the water purification system Slingshot. I'd read about this invention in Popular Science many years ago and marveled at how it could change the world. Since then there have been new desalination plants built in arid parts of the world, but using membrane filters, not Slingshot. This wonder technology never reached the open market. Other developments in this book are also not yet available. This isn't a new phenomenon. I was a freshman in high school in 1990 when I first heard of embryonic stem cells, and how one day they would make the blind see, the crippled walk and cure all manner of diseases. All it would take is 5-10 years and adequate funding. In the year 2000 the story was the same, with hope being 5-10 years out, provided there was funding. 2010 brought the same claims, and today after nearly 30 years the blind do not see, the crippled do not walk, and diseases this wonder cure was supposed to fix remain as bad as they were in 1990. Many new technologies fail to pan out like this, so promising a better future based on today's lab work is speculative. The author stated we must be more open to risk, and used the X Prize as proof how incentives can bring about leaps in technology. This may be the case, but the author didn't risk anything by making the X Prize. He borrowed other men's reputations to promote it and other men's wealth to fund it. Nor did he help in any of the competing research team's work or funding. The author threw down the gauntlet and waited for good things to happen from other people taking risks with their time, money, reputations, and potentially with their lives. Near the end of the book is a section on what could go wrong in the rapidly advancing society the author seeks. I respect him for mentioning potential downsides to his vision of the future. I believe, though, that he minimizes some of these risks, especially in regards to biological attacks. He stated viruses can only spread as fast as men can travel, as if it was a limiting factor regarding the spread of disease. Air travel means a man can cross the world in less than a day, bringing with him any disease he carries and spreading it to millions of new hosts. If a bio terror attack occurred in Midway Airport in Chicago and infected passengers in the main terminal with a disease like the 1918 flu, it would spread to every inhabited continent within a day's time, and the 50 million death toll from 1918 could be dwarfed by the resulting loss of life. The author claimed in the same section that we could provide rapid and effective treatment if a pandemic occurred, yet stated a few pages earlier that the bird flu vaccine rushed into service was ineffective. Both statements cannot be true, and when the second one is a fact we must assume the first is blind optimism. I am an optimist, although I can see why you wouldn't think so by reading this review, but I am not blindly optimistic. There is ample evidence that technology will continue to advance, but there are plenty of cases like embryonic stem cells where money and hard work don't lead to the kind of breakthroughs predicted in this book. I believe we as a people will continue to advance, but some of the claims in this book are no different than people in the 1950s thinking we'd have flying cars in the 1980s. With the election of Donald Trump and renunciation of the Paris Climate Treaty, the world seems to be spinning even more out of control. As I write this review, wild fires are burning out of control in the west and a giant ice berg has broken off of Antarctica. So any well written book that argues that advanced technologies will help us better manage our world is received with some relief. Having finished his book, I am more convinced than ever that the world will come up with the appropriate solutions needed to respond to climate change. "Abundance" is a counter-narrative to the alarming news that seems to come out every day. Highly recommended. This books points out the marvelous technological possibilities in the near and distant future. Diamandis is optimistic, perhaps too much so. Can all of these wonderful things happen? Maybe. But the author counts on humans operating reasonably and logically. He does not consider the necessary political resolve and the potential obstructions of wars and climate change. Hopefully, a world of abundance may be in the offing, but only if we act with wisdom and maturity.